Roger Pelletier and Val Arnault-Pelletier can’t say enough about the great treatment and care they received at Royal University Hospital after Roger had a stroke at home in Dalmeny on November 23. From the initial care he received in the busy Emergency Department, where “ten or so medical people” acted quickly to assess him; to the treatment he received by the neurologists and team on Unit 6300; to all of the specialists involved when he eventually had surgery on a carotid artery: Roger remains most appreciative of the professionalism of everyone involved. “There was always someone around me, reassuring me. I was treated like a valued person, with kindness and respect. It was like I was the only one there,” he reflects. Val was particularly impressed by the holistic care at RUH that encompassed, beyond the necessary medical treatment, the family’s physical, emotional and spiritual needs. 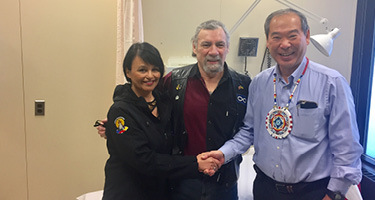 They were offered access to resources such as a room for prayer and smudging, as well as support and help from an elder and a social worker, through the First Nations and Métis Health Service. Whether for the kind reassurances of Roger’s neurosurgeon Dr. Kotoo Meguro, the professionalism of acute stroke teams such as Dr. Kerri Schellenberg and Regan Cooley, or for the physiotherapists who travelled to Roger’s home in Dalmeny to get him started on exercises to regain the use of his right arm paralyzed by the stroke, the couple is effusive in their gratitude and praise for RUH professionals. “People are often quick to judge, but until you are in a situation of medical distress and are part of the services that are offered, you don’t know. From my admission to my operation to the continued support from medical people at RUH, I was so impressed,” says Roger. If you or someone you know is grateful for the care received at RUH, consider making a donation in honour of your medical team. Donate online or call 306.655.1984.